May 1, 1931: The start of singer Kate Smith's long and rosy radio career on CBS coincided with this, her birthday. Smith, then 22, had to do her nationally broadcast daily program with no sponsors and a measly pay of $10 a week (equivalent of $149 in 2012 economics). But in a month's time, her pay rose to $1,500 a week, (equivalent to $22,466 in 2012 economics)-quite an improvement from when she started out! Kate Smith was a great American singer. She had sung at the opening of sport events and could amazed the audience and official crew including the player. They said ""It ain't BEGUN 'til the fat lady sings!"" Smith was 5'10"" tall and weighed 235 pounds at the age of 30. In he autobiography, she mentioned that she was Living in a Great Big Way. She assinged Ted Collins to help he wrote he autobiography. Smith was a pioneer star of radio, usually accompanied by Jack Miller's Orchestra. Her debut program was twice-a-week NBC series, ""Kate Smith Sings"", and then ""Kate Smith and Her Swanee Music"" that was aired on CBS. 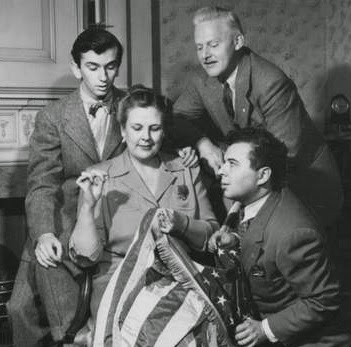 The Kate Smith Hour was one of Kate Smith's program that became a leading radio variety show, presented comedy, music and drama featured by top personalities of films and theater for eight years (1937–45). The show's resident comics, Abbott and Costello and Henny Youngman, introduced their comedy to a nationwide radio audience aboard her show, while a series of sketches based on the Broadway production of the same name led to The Aldrich Family as separate hit series in its own right in 1940.